ConnectWise provides a great database for managing your IT services organization, the interface just isn't always the quickest. 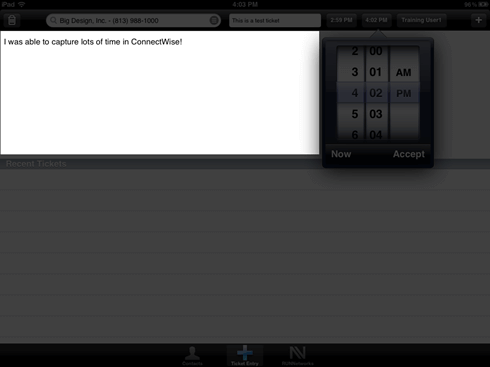 The RUNNetworks Automator makes it quick and easy to enter simple time entries into your ConnectWise system. With the RUNNetworks Automator, your technicians will be able to quickly enter their time when they perform services instead of entering it later. And it helps your technicians capture time on one screen with 6 simple actions, instead of loading screen after screen after screen. First, let me tell you what the Ticket Entry part of the Automator does when you hit the plus button to add a new ticket. It creates a Ticket in ConnectWise for the company you selected. 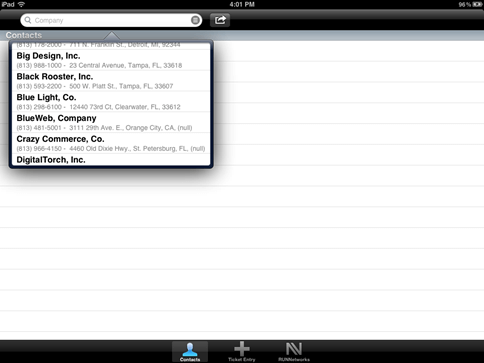 It creates it using the default service type (Automator), and the default status of In Progress. Then, it creates a Time Entry with the default work type (Regular) to start and end at the time you selected, and adds the description of what you did. Then, it sets the status of the ticket to Pending Closed. Here's how Ticket Entry works in the interface(we'll run through the iPad version first, and then show you screenshots of our upcoming iPhone version). 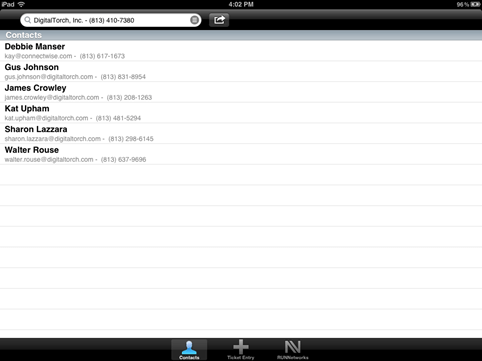 First, you'll tap into the Company search box, and type in the name of the Company you want to add a ticket for. Then, tap over to the Ticket Description, and enter a description of a ticket. 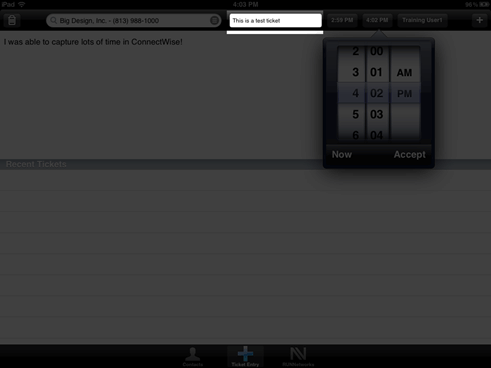 Next, tap on Start to pick the time when you started work on the ticket. 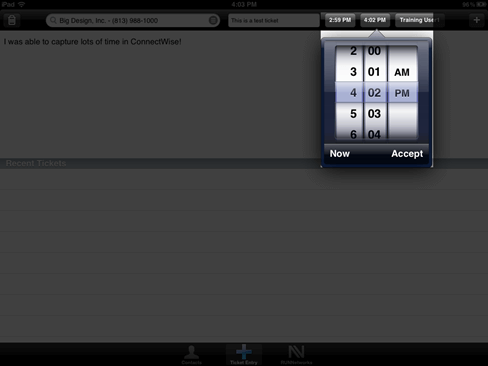 Roll to the time you need, and then tap Accept. 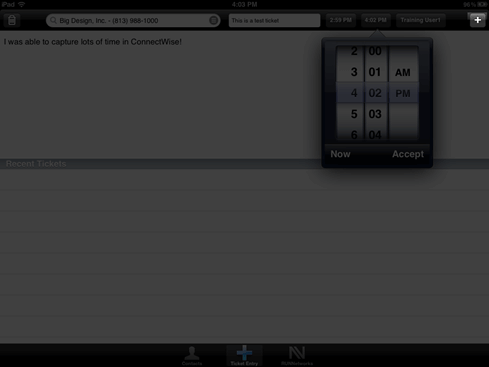 Tap End to pick the time you finished (or tap Now to be done right now). 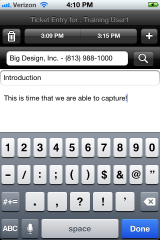 Enter in a description of what you did, which will go into the notes field. Finally, click the Plus button to enter the ticket in. And there you have your new ticket! 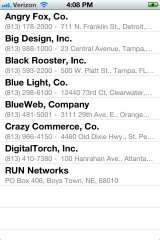 To search for a contact, on the Contacts screen, enter in the first couple letters of their name in the company field, and tap on the company when it comes up. 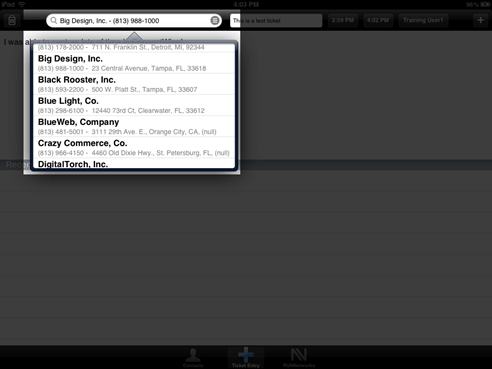 On the iPad, you can tap on a company name to send them an email, or if you press the Action button, it will load the company's address into Google Maps so you can navigate to them. 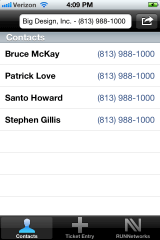 Finally, just a little bit to whet your appetite for the upcoming iPhone version. Do you have questions or suggestions on how to improve the RUNNetworks Automator? Send them to us!